Sorry Australians, there was no Chinese "Spy Ship" following HMAS Adelaide around. An Australian warship arrives in Fiji, shadowed by a Chinese Spy vessel, and while the Australians were told there would be a Chinese fishing vessel beside them, they were surprised to find this Chinese "fishing vessel" was actually a SIGINT vessel, with all its attention focused on the Australian ship. I can't tell if I'm disapointed or pleased with this, since it gives some validity to the belief that the Australian news media push a "red scare" narrative, just like the American news media; but they have different "Reds"! In America, it's the Russians who are coming. For Australia, it's the Chinese. On a certain level there's some truth to both, but nothing like what's being portrayed by these misleading articles. 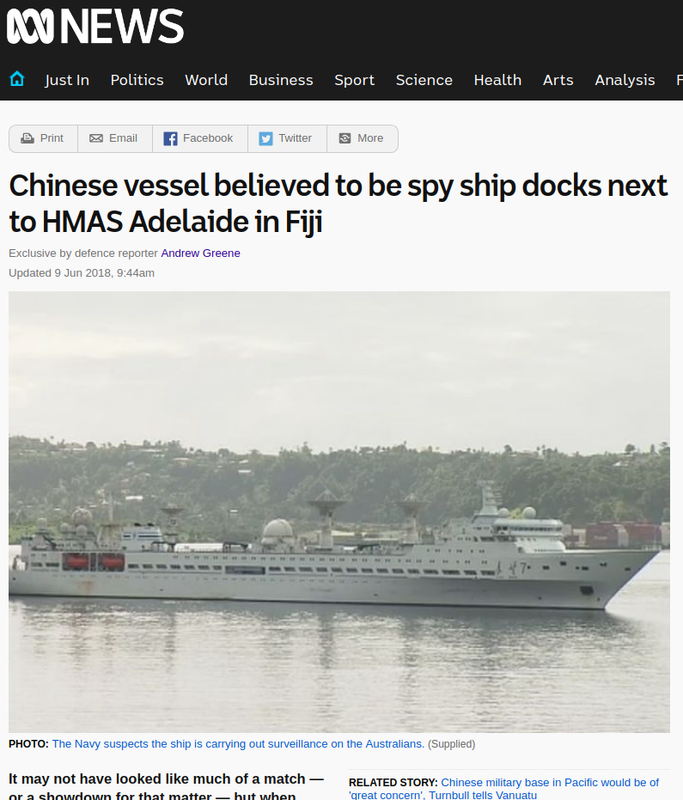 While it's true that the Chinese are exerting their influence in the Pacific, this story isn't about that, it's about a Chinese Spy Ship tailing the Australian Navy, and that just didn't happen. HMAS Adelaide (IMO:9608972|MMSI:503000021) was the ship the Chinese were supposedly focused on, and one of the largest warships the Royal Australian Navy (RAN) has; she's a Canberra-class landing helicopter dock (aka LHD). She's their crown jewel. 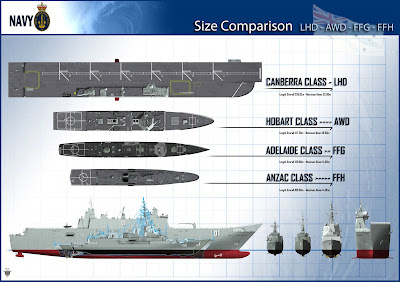 That may be why the 2nd ship, the HMAS Melbourne, an Adelaide-class guided missile frigate (FFG), garnered no attention at all. Here are the facts. HMAS Adelaide departed Townville, Australia on 2018-06-01, arrived in Suva Fiji 2018-06-08, and left again 2018-06-11 heading to Togo, per the information broadcast by their publicly available AIS transponder data. 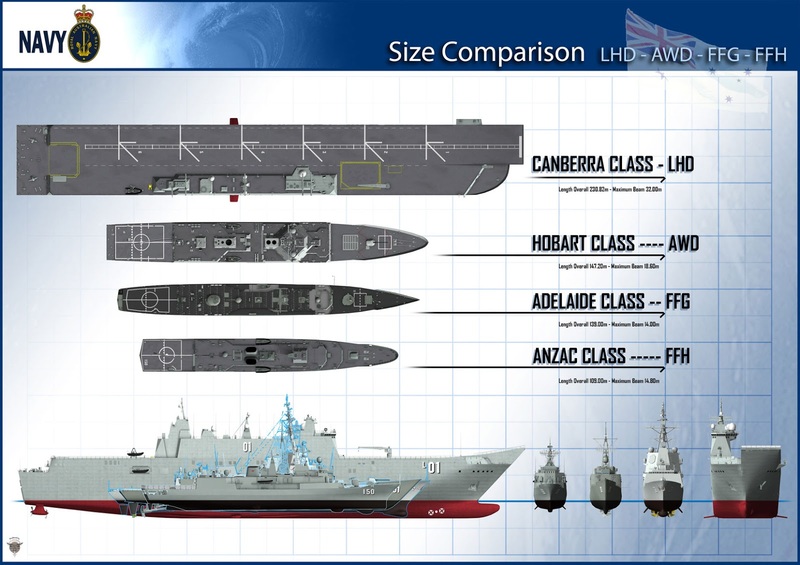 There is no reason the Australian press needed to ignore any of this data, and unfortunate the Australian MoD didn't put out a press release specifically debunking the misinformation that was running rampant. Yuan Wang 7, the "Spy Ship", which is actually a Chinese PLA(N) satellite telemetry ship, arrived and moored in the port of Suva Fiji right before the HMAS Adelaide docked, but the Chinese vessel didn't dock as was reported, they stayed moored in the harbour for days. Yuan Wang had been operating to the North, and came from that direction, while the Australian Ships came from the West, or as they call it, Australia. At no time was the Yuan Wang 7 "chasing" or "tailing" the Australian ships. That detail is simply impossible, they were not in proximity of each other until they both arrived in Fiji. The Australians left Fiji 2018-06-11, and the PLA(N) Yuan Wang 7 left 2018-06-15, both in different directions even. None of these facts line up with the overall Australian news media's depiction of the events, and that's a little disappointing. There is hope for the Australian news media, so they don't get punked by unreliable sources in the future, and I'm here to serve it up for them as easily as I can possibly make it. Point and click. Here are all the Yuan Wang vessels, with their corresponding links to MarineTraffic.com, where you can see them (for free) if they're near a shore based AIS-T receiver feeding into to their service. With a paid account you look up more history, and can purchase satellite-based AIS coverage, so you can see the vessels when they're farther out at sea. If you're thinking to yourself that it would be ridiculous for a cloak and dagger "spy ship" to have their transponder on all the time, there might just be hope for you yet. SIGINT collection vessels, AGIs, don't usually have their transponders on at all. What hasn't been mentioned either is every ship is a "spy ship"; it's every Navy's responsibility to gather intelligence when the opportunity arises, and I'm quite sure Yuan Wang 7 was collecting some intelligence from both of the Australian warships it found itself in proximity to, but it's far more nuanced than the Australian news media portrayed it. There is only one loose end. The Yuan Wang 7 started to sail toward Fiji, at relatively high speed, on 2018-06-05 ~14:00Z. It seems the Royal Australian Navy "for OPSEC reasons" doesn't transmit their location using AIS-S, so I don't know if on, or around, 2018-06-05 they also started heading towards Fiji, or gave the Chinese some other tell that made the Chinese make a sprint for Fiji at almost 20kn (pretty fast for such a big ship). Some sarcastically suggest it's "quite a coincidence" that they all arrived around the same time, but the PLA(N) Yuan Wang 7 restocks in Fiji regularly, so it isn't as wild a coincidence as it may seem to someone unfamiliar with the vessel's previous movements. To reiterate, I'm not suggesting any Chinese Navy vessel wouldn't collect intelligence on the Australian ships, of course they would, but the reverse is true too. Both countries are regional powers with significant naval presence. Unfortunately, the stories about this encounter got almost all of the facts wrong, and they really didn't need to. All of the location information I've referenced above would have been at their fingertips if they'd known where to look on June 9th before the story was published. and didn't dock until days later.